Nic Dowd scored twice and Peter Budaj made 25 saves for the Ontario Reign (20-9-2-1), but it wasn’t enough to stop the Bakersfield Condors (15-14-2-2) in a 4-2 loss Saturday night at Citizens Business Bank Arena. Bakersfield opened the scoring at 8:15 of the first period with a goal from forward Tyler Pitlick. At 17:59, the Condors struck again when forward Joshua Winquist scored on the power play after forward Paul Bissonnette was called on a penalty for unsportsmanlike conduct. Dowd scored his first goal at 14:22 of the second stanza. Defenseman Kevin Raine tried to launch a shot home, but the rebound went off the crossbar and squirted out to Dowd who knocked it in past netminder Laurent Brossoit (29 saves). Sean Backman was credited with the secondary assist for his team-leading 28th point of the season. Ontario started the third period with urgency and were handed a power play opportunity after defenseman Griffin Reinhart was called for tripping defenseman Vincent LoVerde. The Condors would capitalize shorthanded, however, as forward Rob Klinkhammer fired a shot past Budaj unassisted at 7:20. Minutes later, Dowd tallied his second marker on the power play, scoring on a backhanded pass from Michael Mersch. Dowd tipped it over Brossoit and Kevin Gravel earned the secondary assist. 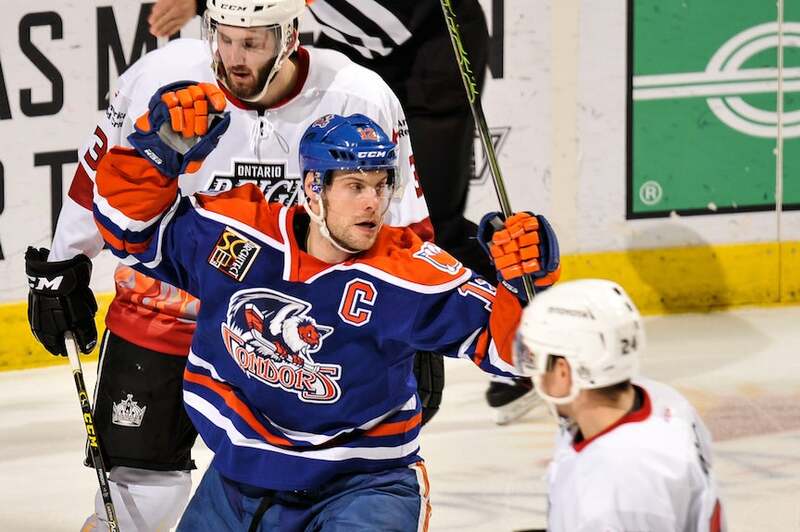 Miller scored an empty net goal with nine seconds left on the clock to seal the Condors’ 4-2 victory.